I am an out and proud cookbook collector and I suspect most people who enjoy baking, cooking or write their own blog are as well. However I not only collect cookbooks, I read them like I would a regular book. In fact, there are certain cookbooks I actually prefer to read rather than cook from. Not because the recipes are poor, rather the writing is so wonderful and the ethos of the book commands your full attention. How to Eat by Nigella Lawson and Kitchen Diaries 2 by Nigel Slater, to name a few, are regulars on my bedside table. I found I became a better and more adventurous cook and baker when I began to read cookbooks cover to cover. Which makes sense I guess. You become a better student at anything if you study it more. What it did specifically, was introduce me to new techniques, flavours and ideas then got me thinking about food more often. I credit the inspiration for my blog and confidence in sharing my views about food to some incredible cookbooks sitting on my shelves at the moment. 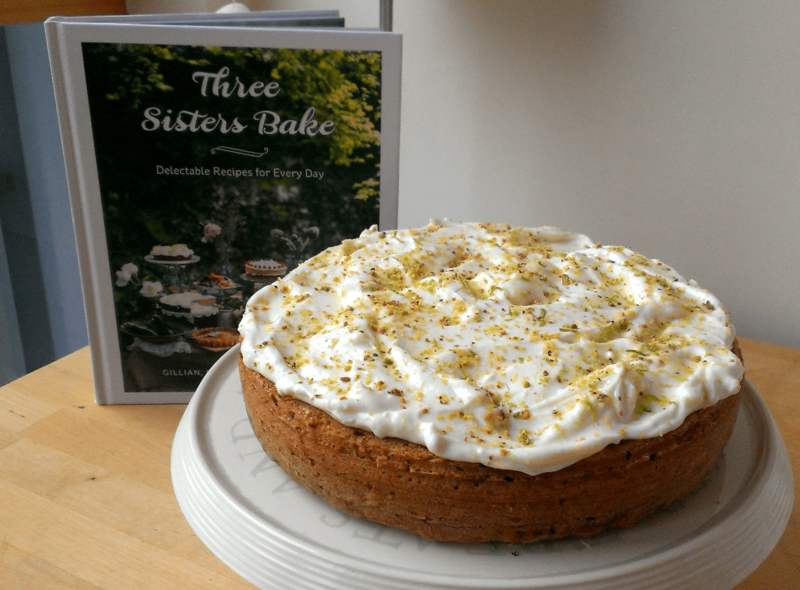 The most recent addition to my collection is Three Sisters Bake: Delectable Recipes for Every Day by Gillian, Nichola and Linsey Reith. These sisters have been creating quite an impact on the Scottish foodie scene with their quaint cafe in Quarriers Village. If you read my previous post you get an idea why. They churn out simple yet elegant cakes and fantastic home cooking with a relaxed vibe. So I had extremely high hopes their cookbook would emulate this wonderful ethos. As it turns out, I wasn’t disappointed. This is 1 of Three Sisters Bake’s more curious of cakes and I figured if I was going to test a recipe from this book, it may as well be a flavour combination I’ve never tried before. I didn’t deviate much from the recipe. I only adapted it slightly to suit the contents of my cupboards (vanilla sugar), introduced an edible decoration (ground almonds & pistachios) and upped the quantities of the frosting to make a little more. Heat the oven to 160C. Grease, flour and line a 20-22cm cake tin. I used a loose bottomed spring-form tin. For tips on how to grease, line & flour a tin, click here. 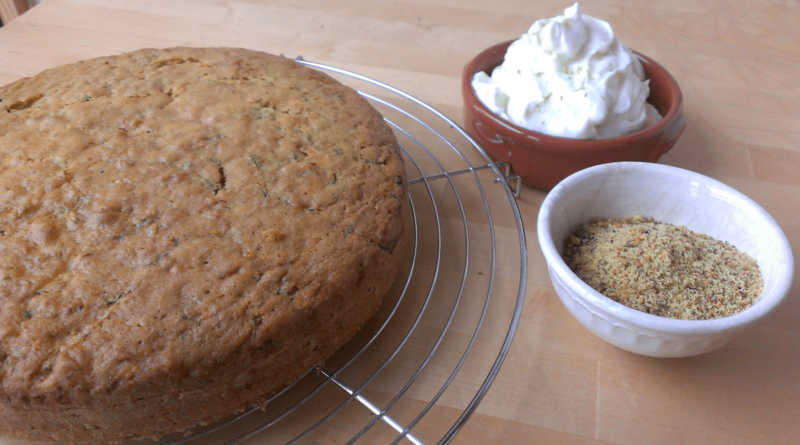 Courgette – by far the strangest thing I’ve baked into a cake. 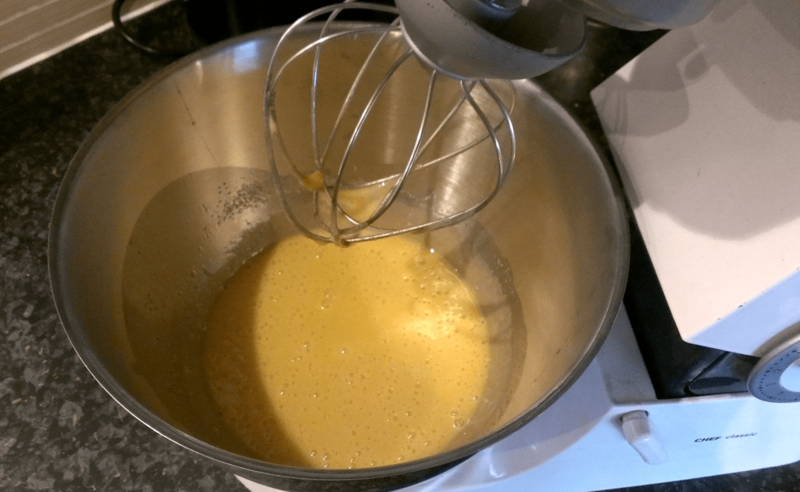 Using a free-standing mixer, handheld electric whisk or a bowl and spoon, beat the oil and eggs together for 3 mins until combined to a pouring consistency. It should now resemble a thin custard. The oil, rather than butter, helps to keep the sponge very moist. Measure out the flour, baking powder and bicarbonate of soda then sift these dry ingredients into the egg mixture. 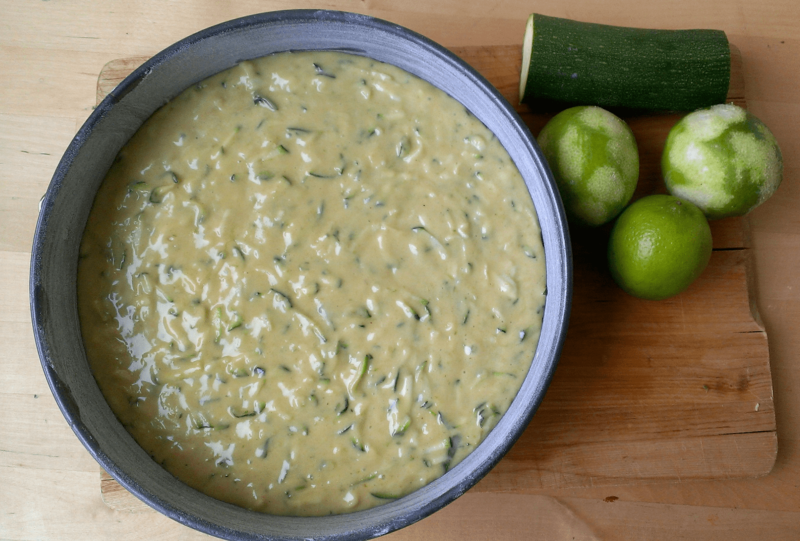 Grate the courgette using the large holes of the grater and add to the cake batter with the lime zest. 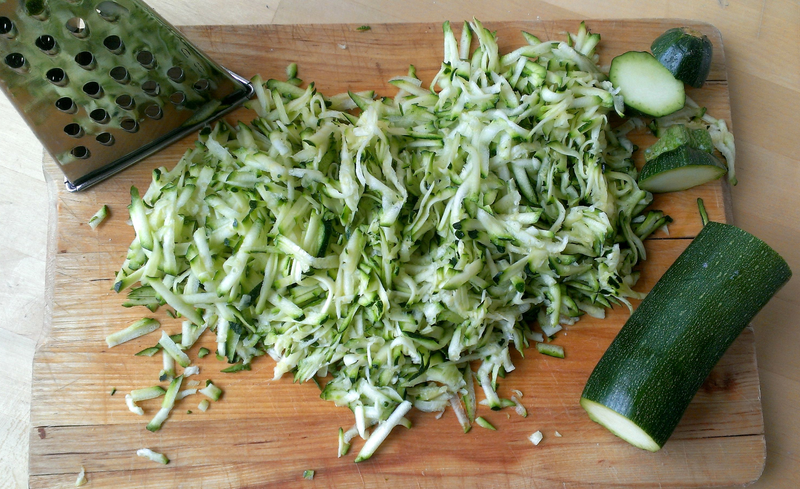 Grate the courgette using the large holes in the grater. Mix the cake batter gently until combined but don’t over mix otherwise you may lose the air. Scrape the cake mixture into the cake tin and bake in the middle of the oven for 45-50 mins. Scrape into the tin & level with the back of a spoon for an even rise. Check the cake after 40 mins (because all ovens will vary) by inserting a skewer into the middle. If the skewer comes out clean the cake is ready. If the skewer has got cake batter or crumbs sticking to it, the cake needs a little longer so give it another 5 mins and check again. Do not over cook otherwise the sides will become crunchy. When the cake is cooked, remove from the oven and leave to cool in the tin, on a wire rack for 15 mins. Remove the cake from the tin, gently peel away the paper and leave to cool on the rack until completely cold. Zest the lime into a small dish and set aside. You will use this to decorate the cake but its easier to zest a lime before its been squeezed. Blitz the pistachios in a food processor or bash with a pestle & mortar until you have a fine powder. Mix with the ground almonds and set aside until ready to use. Make the icing by beating the cream cheese until softened. Sift the icing sugar over the top and add the juice from the zested lime. Mix well until incorporated. Decorate with zesty cream cheese frosting, ground nuts & lime zest. Sprinkle some of the ground nuts over the top and finish with a sprinkling of the lime zest. Serve in thick slices with a fork. This will keep in the fridge, covered for 3-4 days. If it lasts that long. Serve in slices with a cuppa tea. Perfect for Easter lunch. 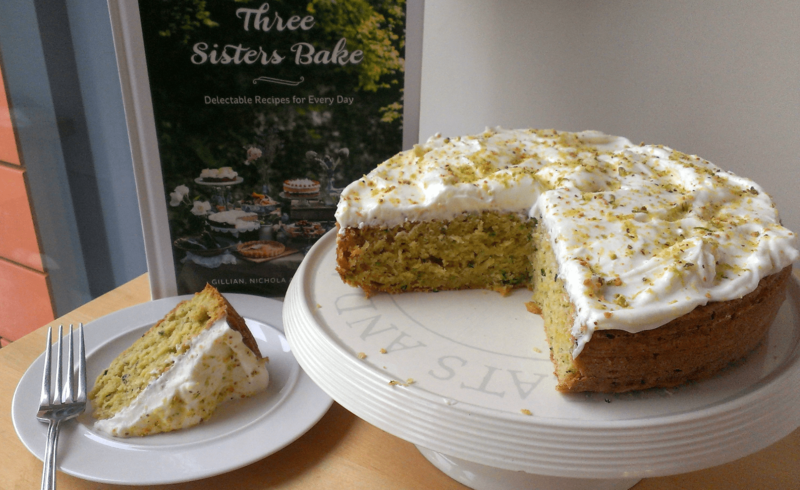 I didn’t expect much from this cake and, as I’m sure most people will be, wasn’t really convinced with the idea of adding courgettes to the cake so I was surprised at just how much I enjoyed it. 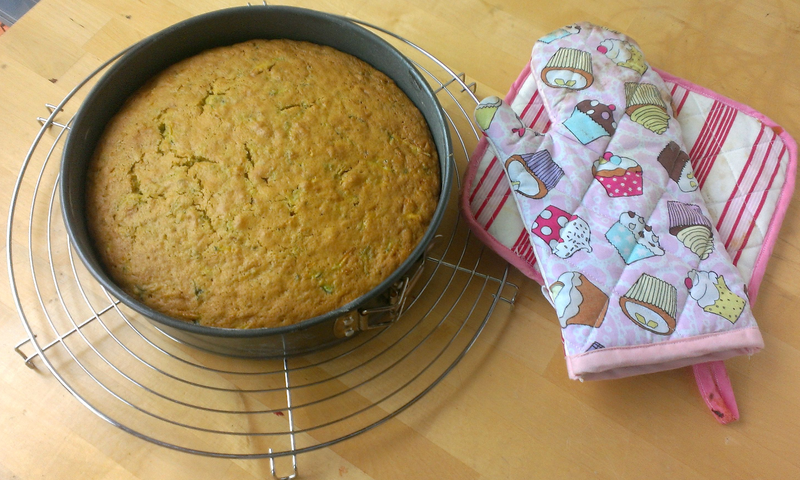 The courgettes gave the cake a lovely pale green colour (something to remember for kids birthday and Halloween cakes perhaps?) and it was the veg along with the oil which really helped keep the cake incredibly moist, even after 3 days in the fridge. I also expected this cake to be very dense and heavy so was pleasantly surprised to discover it was a very light and airy cake, even with the addition of the frosting. In terms of the flavour, don’t let the courgettes put you off. Not that courgettes taste really of anything anyway but you certainly wouldn’t have suspected their presence if you hadn’t known about it. 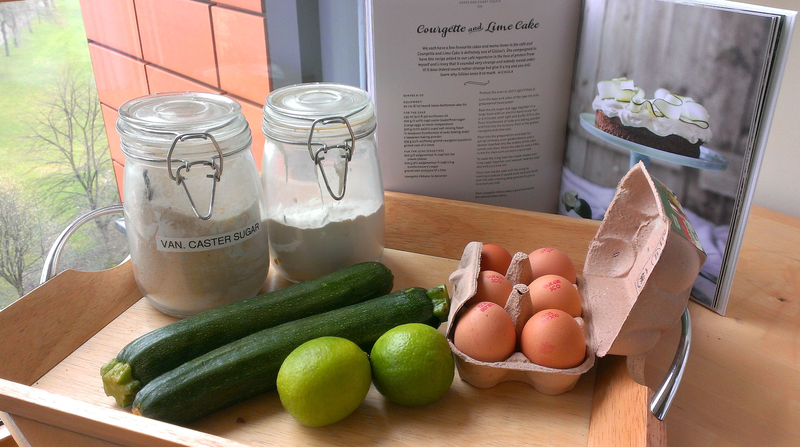 A friend (whom is always happy to taste-drive my cakes) mentioned the grated veg could easily be mistaken for lime zest. I think what I liked most about this cake, and why I reckon others will like it too, is that its not very sweet. The actual sponge itself is almost savoury in a way but its lifted by the frosting. Which again, is not sickly sweet. It is however, a very tart and zesty frosting which on any other sweet cake I would replace, but I reckon this cake needed the frosting to stop it being too bland. This is the kinda cake you want to serve with a cup of tea. Your Granny might even like it. I reckon there is also room to play around with the cake base. Given its savoury undertones it could make for a delicious loaf. Spread with salted butter it would encompass the greed I’m so fond of and yet still form part of my 5-a-day.